You know that tuning your violin is something you need to do, but what exactly does it mean? The word tuning refers to adjusting the strings of the violin to their proper pitches. All sorts of factors can affect the pitch of each string — temperature and humidity changes, drafts, playing loud music where the bow pushes heavily on the string — so you need to know how to tune effectively, right from the start. You may be wondering how to know when your violin needs tuning. Well, a big clue may be that everyone in the house is walking around wearing earplugs! But seriously, you’re able to tell because the songs sound strange when your violin’s out of tune. To help you along, you can listen to the correct tuning of each string — G, D, A, E.
Violinists tune their instruments by tightening or loosening the tension of each string until it sounds at the correct pitch. Turning the pegs or the fine tuners is the way to tune your strings. The tighter the string, the higher the pitch. If you happen to have a piano hanging around the place, tuning with the piano works very well. You can play the note you want and then press the sustaining pedal with your right foot so that the note goes on sounding while you tune your violin string to match. Pianos usually stay in tune for much longer than violins, and pianists don’t get to tune their own instruments. A professional tuner visits about twice a year to tune the 200‐plus strings on a household piano. The names of the violin’s open strings from lowest to highest are G, D, A, and E.
Play G below middle C on the piano. Sing or hum that note. Pluck the G string of your violin — the one on the far left when the violin faces you — and then sing that pitch. Many violinists have some choir singing experience, so they can tell if their violin’s G is lower or higher than the desired pitch by singing and then comparing the two pitches. If singing isn’t your forte, press down the right sustaining pedal of the piano with your foot so that the piano G hangs on a lot longer while you compare with your plucked string. If the violin’s G sounds lower than the piano’s G, turn the fine tuner to the right. And yes, if the violin’s G is higher than the piano’s, turn the tuner to the left. You may need to make up to three full turns of the fine tuner to change pitch to the next note. Pluck the violin’s G string. Watch the gauge on the tuner, where you see a little needle moving around. 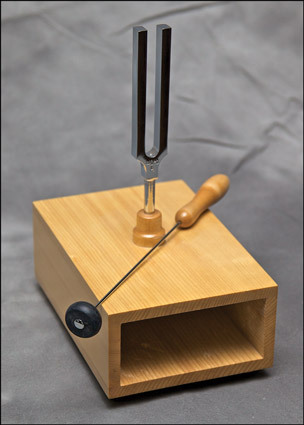 The needle registers the pitch and tells you if your note is too low or too high. The tuner may also have a green light, to tell you when you’re on the best pitch. Make the adjustments to the violin string using the fine tuners (tighten if the note is too low, or loosen if it’s too high). The tuner keeps telling you how you’re doing as you adjust, until the little needle of the tuner is on target. When the needle stays in the center of the gauge — bingo! Your violin is in tune. Continue through the D, A, and E strings using Steps 3 through 6. If you’re lucky, your violin outfit may be equipped with a pitch pipe. All sorts of pitch pipes are available at specialist music stores. 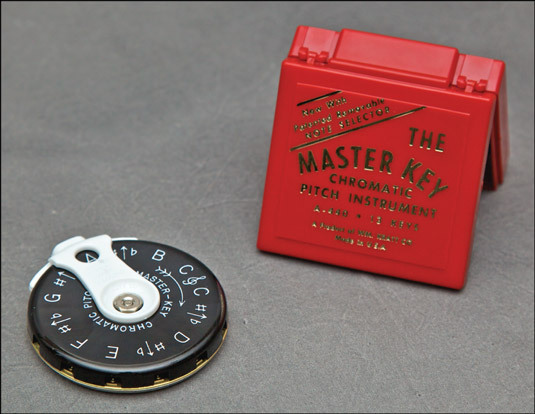 A pitch pipe is a very low‐tech and handy item to keep in your violin case because it’s light and portable and can be activated by your breath. The pitch pipe isn’t the most reliable tuning device ever — because the notes it produces vary somewhat in pitch according to how hard you blow — but it does give you a good idea of the sound of each string. Blowing into a pitch pipe, you can produce each of the violin’s four pitches: G, D, A, and E. Starting with the lowest string, G, play the G on the pitch pipe (each pipe has the note’s name on it), and then continue through the D, A, and E strings, tuning each string to match the pitch pipe’s sound. This pocket‐sized piece of metal consists of a handle (stem) and two tines. A quick rap, preferably not on the knuckles, sets the tines vibrating. Today, many musicians keep a tuning fork in their violin case, for ease of tuning the A string. With a little experience, you can get the other strings to the correct pitch after you have tuned the violin’s A to the tuning fork’s A. You can’t eat dinner with a tuning fork. The sound fades rather quickly with a regular tuning fork, so scientists invented electrically driven versions to sustain the sound for longer periods of time. 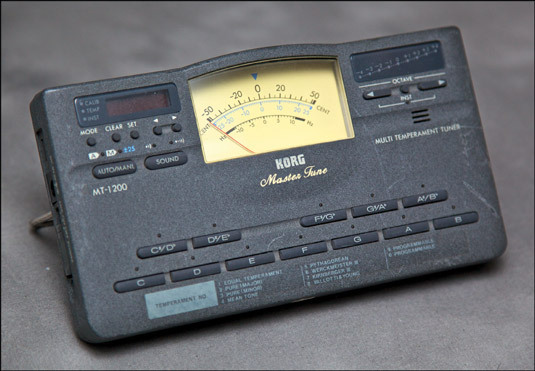 Nowadays, most electronic metronomes have a setting that sounds a sustained A for tuning purposes. To make the tuning fork sound, hold it by the stem, tap the tines firmly on your knee, and then touch the very end of the stem lightly on the top of your violin to amplify the sound. You hear a pure and ethereal‐sounding A, which is the pitch to which you tune your violin’s A string.